Presenting data effectively changes the kinds of conversations that can happen inside organizations. Better presentations shape an improved culture of decision-making. Let me tell you about a recent example of this. Late 2012 I got a call from an evaluation officer who was working at the Walton Family Foundation. (Yep – *those* Waltons. Whatever your opinion of Walmart, the foundation is doing some good work. While I can’t tell you the details of their data, you’ll just have to trust me that their investments in environmental initiatives are truly impressive.) She said her group was ready for change, ready to learn ways to present better. We really only made 3 small changes. I added a trendline to show the row of numbers preceding it, so that the overall pattern is clear. That green dot at the end of the trendline? That’s the target they are aiming for in 2019. The target is listed numerically in the column next door. And in that target cell, you’ll see that some have a red dot. I used conditional formatting to set up a formula which calculates their predicted value in 2019 based on their current data and the red dot shows up when they aren’t going to meet their target as things stand without some serious intervention. Talk about being able to make actionable decisions! And then the modified bullet graph shows progress to date. So only 3 changes, really. Plus some light graphic design in terms of colors and such. Karen and her team showed this dashboard to their board, who saw it as a real improvement. 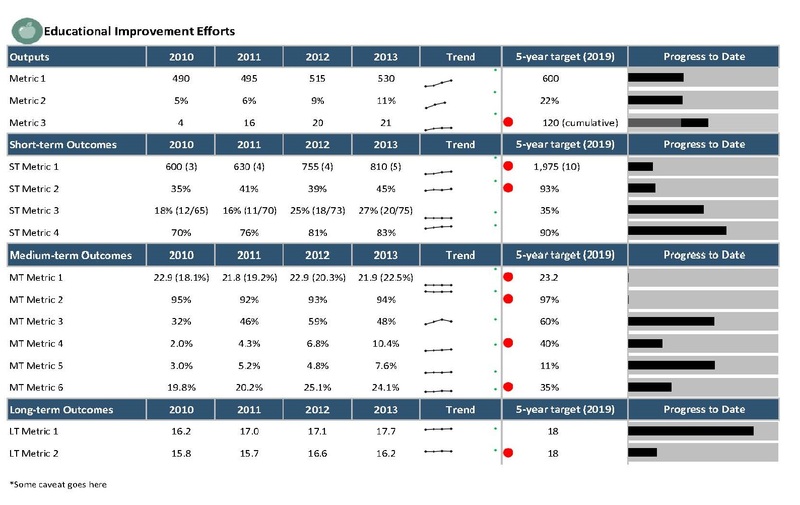 In late 2014 we have been dashboarding even more. So, good for me and my business but let’s talk about what happened inside the Walton Family Foundation. And *that’s* the kind of difference that can be made by presenting data effectively. This cross-post is part of a collaboration on the intersection of Data Visualization and Culture by Gavin McMahon and Stephanie Evergreen. Read Part 1 and Part 3. Stephanie is a worldwide data presentation consultant and author of Presenting Data Effectively. She blogs at StephanieEvergreen.com. You can follow her on twitter @evergreendata.